Voltage-gated potassium channel. 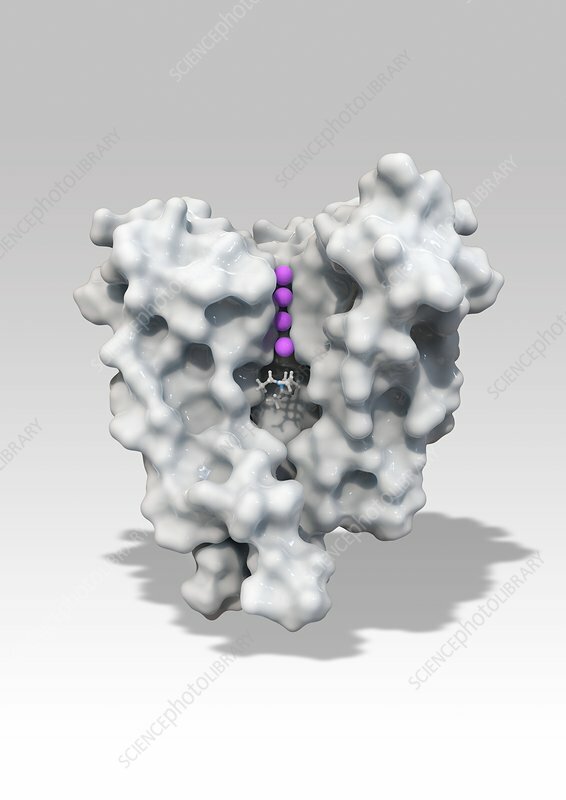 Computer model showing the molecular structure of a voltage-gated potassium (Kv) ion channel. Ion channels are membrane-spanning proteins that form pores in cell membranes and act as pathways for the movement of inorganic ions into and out of the cell. Kv channels are specific to potassium ions (K+) and are sensitive to voltage changes in the cell's membrane potential. During action potentials in nerve cells, they play a crucial role in returning the depolarised cell to a resting state. The channel is a tetramer, composed of four subunits. Here, one subunit has been removed to reveal the potassium ions (pink spheres) in the selectivity filter (centre).